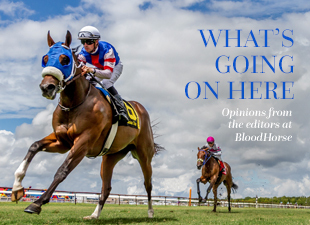 Asked to take a swing at profiling the rising stars in the Thoroughbred breeding and racing industries by our publisher and editorial director John Keitt Jr., the staff of BloodHorse came up with what we think is a pretty good first cut. Of course, the snapshots of the 28 individuals featured over 15 pages are just that—snapshots. There is much more to each individual story than the brief space allotted in print. Every player has his or her own complex backstory about falling in love with horses and the business; involvement with the industry; and plans to move it forward in the coming years. And even more importantly, this is by no means an end-all grouping or listing. Hundreds of other “young” players are out there finding their ways through barn areas from the Northeast to Southern California, and at breeding, breaking, and training operations from central Florida to Washington state. Just because they didn’t make this roster doesn’t mean they aren’t the ones on the forefront of the industry tomorrow. And let’s emphasize that these are not necessarily “young guns.” The vast majority has been in the business for a decade—if not longer—and have quickly established their own track records. And while most have parents involved in the business, there is ample room for those that have shown the desire to succeed to make their own way through this complicated but thoroughly fulfilling endeavor. First and foremost was a respect for the animal. To a person the future leaders of the sport have a love and a reverence for the majestic creature that is the Thoroughbred. There is also a respect for the past—through both pedigree and the history of the sport—that may be missing from the “next generation” of other sporting ventures. It was stressed to us by one contemporary—who is not on the list but is a participant in racing—that he’s learned the importance of buying horses from the “right” people who have “raised a horse the right way.” While certainly speaking from the heart and perhaps limited experience at his age, that young man appears to be wise beyond his years. That comment goes hand in hand with another theme: reverence for the land. This crew seems concerned about conservation and cares about the benefits of fresh air, water, and good ground. Along with that is the “lifestyle” the horse industry offers. Several of those interviewed used that buzzword in their comments on the benefits of being a player in the game. And the “lifestyle” is a strong selling tool. Many in the group who ply their trade as bloodstock agents have built partnership entities that have brought countless of their contemporaries to the sport. The use of the Internet and technology helps tremendously, allowing partners to stay connected to their horses, and to one another, through emails, websites, and videos. He was not alone. And to a person, most of them realize how lucky they are to be in the position they are in now. And everyone in the business—at any age—should realize how lucky we are to have them.